Luxury Lodges Wales01686 430 491work Self-cateringIdeally located between Snowdonia to the north and Cardiff to the south, with the Welsh coast including Aberystwyth and Aberdovey just a half hour drive away, you will have easy access to a wide range of sporting and leisure activities including fishing and mountain biking for all ages throughout the year. 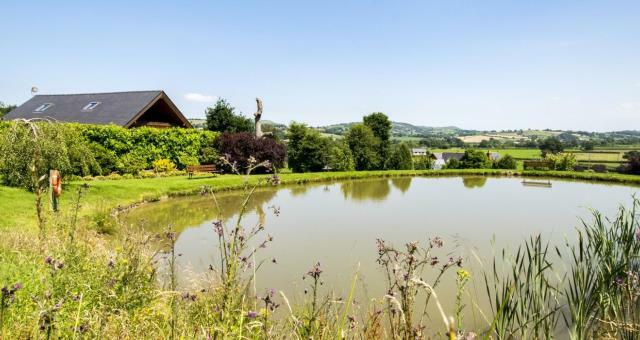 The lodges are situated in a peaceful and tranquil setting over-looking the Trannon valley, and provide sumptuous accommodation to a 5-star standard. Sited on a eighty-acre estate with two wild-life ponds you will have a unique, romantic and relaxing experience when you visit. 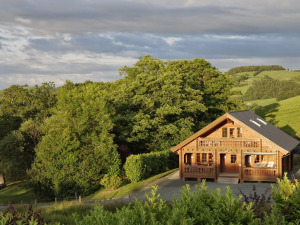 Each centrally-heated lodge has one double and two twin/double bedrooms, with a hot-tub on the downstairs veranda, a Jacuzzi/powershower in the main bathroom, 3 flat-screen televisions with Sky, a DVD-player, WiFi access, and a fully-equipped kitchen - it's all there for you. Plus ample car-parking, wheelchair access downstairs, and a barbeque facility. All linen and towels are provided too and there is no extra charge for electricity. Ideally located between Snowdonia to the north and Cardiff to the south, with the Welsh coast including Aberystwyth and Aberdovey just a half hour drive away, you will have easy access to a wide range of sporting and leisure activities including fishing and mountain biking for all ages throughout the year. Private Hot tub on each veranda so can be used in all weather! Cot and highchairs available for hire. Throw away BBQ charcoal trays for sale on site for our specially made stands (no cleaning BBQ) Beauty treatments booked directly with therapist (on web site) Free fishing and free fresh eggs from our chickens. Sauna extra charge applies. Children welcome from any age. We are on the B4569 and our entrance is straight of the main road with Grandstand on pillar, please look for signs in hedge row just outside village. Please check in at house. Gravel road up to Lodges, can park alongside tarmac path leading to Lodge and then onto ramp leading to side door.